Holy, Holy, Holy (Santo, Santo, Santo) - traditional Argentine folk melody with easy-to-learn text. Available online here. Miren qué bueno! - based on Psalm 133 (“How good and pleasant it is…”) written by Argentinian composer Pablo Sosa. Fun to do with guitar and percussion or with piano accompaniment (GIA has a choral version - preview here). Tu Has venido a la Orilla (Lord, You Have Come to the Lakeshore) - this Spanish hymn tells the story of Jesus calling the disciples to follow him. It’s in the Methodist hymnal or available online here. May the God of Hope Go With Us - this hymn is in the new Presbyterian hymnal (music available online here). It combines new text (in Spanish and English) with a traditional Argentine melody. Glory, Glory, Glory - based on Luke 2, this is a short, simple Argentine tune with easy-to-learn Spanish text. Do it as a hymn or choral piece (GIA has an arrangement here). Spanish prayer - have you considered learning a short prayer in Spanish? Could be the Gloria Patri or something longer like The Lord’s Prayer that you work on over several weeks. O Waly Waly - this popular English tune works with numerous hymn texts: "The Gift of Love," "Amazing Grace," and "All Praise to You, Eternal Lord," among others. Alley Alley-O - a traditional English folk song about ships in an alley. Add the motions shown in this video to turn it into a fun singing game! Listen to a few audio clips here. Scottish prayer - I love this Christmas prayer by Robert Louis Stevenson (a Scottish poet! ): "Close the door of hate and open the door of love all over the world. Let kindness come with every gift and good desires with every greeting." Read more here. Alle Jahre Wieder - this traditional 19th century Christmas carol references the coming of the Christ child. 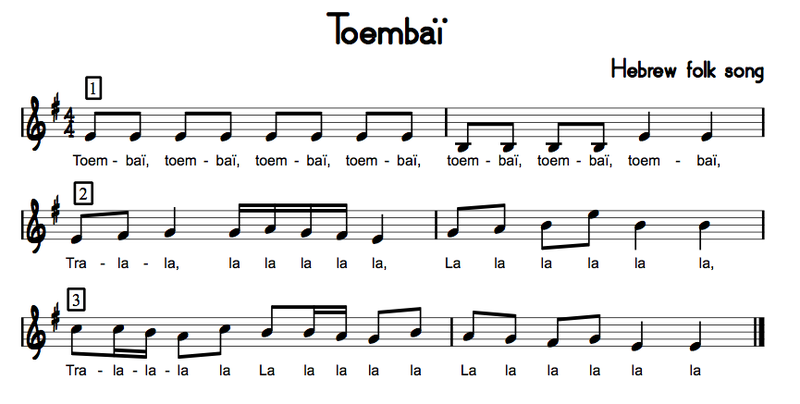 See the lyrics and music notation and watch a video example. Es Ist Ein Ros' Entsprungen (Lo, How a Rose E'er Blooming) - a true classic. Listen to the Stuttgart Hymnus Boys' Choir here. Stille Nacht (Silent Night) - everyone knows Silent Night, but can you sing it in German? Hear the Vienna Boys Choir sing it here. Irish Blessing - "May the road rise up to meet you, may the wind be always at your back, may the sun shine warm upon your face, may the rains fall soft upon your fields, and until we meet again, may God hold you in the palm of his hand. Amen." Toembai - a traditional Israeli folk song, this song may be sung as a round and is often done with an accompanying circle dance (see this video example). See the music here. Zum Gali Gali - a traditional Israeli folk song, often sung in two parts. See a video example here. Obwasimisa - a traditional folk song from Ghana, children sit in a circle and pass a small rock, bean bag, or other item, keeping a steady beat as they go. Watch a video demonstration here and look for the music in Sing Together, Children!. He’s Got the Whole World In His Hands - a favorite among younger choirs! Wander the World with Warm-Ups - a collection of 40 different warm-up exercises using songs from 20 different countries, created by Lynn Brinckmeyer. See inside the collection here. Gathered As One (Paul A. Tate) - one of my very favorites! Written for SAB choir - works well as a combined anthem with youth and/or children's choirs. Listen here. Another way to tie in missions is by incorporating a mission project. Have your choir(s) (and maybe the whole church!) pack shoeboxes in the fall for Operation Christmas Child. Raise money to donate to a music organization or charity like one of these. I always like to include Scripture verses in my planning - usually one per month. Post it somewhere in your choir room so you can read it together at the beginning of rehearsal, make it a goal to memorize the verse by the end of the month, or send children home with a Scripture Card (include the reference and space for them to copy it down at home). Offer some kind of incentive for children who bring their completed Scripture card back during the month! Psalm 86:9: "All nations whom you have made shall come and worship before you, O Lord, And shall glorify your name." 1 Chronicles 16:31: "Let the heavens rejoice, and let the earth be glad; and let them say among the nations, 'The LORD reigns.'" Looking for more inspiration and ideas? See my "Around the World" board on Pinterest!